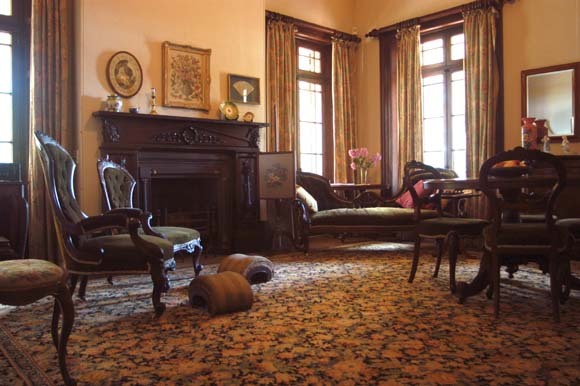 This room was originally the drawing or morning room for family use. In the original design of the building, visitors were to be entertained upstairs in the ballroom. When the upstairs area was converted to a bedroom and a library, this room became the reception room. An outstanding feature is the fireplace surround with its unique design and workmanship. The mantle is neoclassical with a French Empire wreath and ribbons carved below it. The Indian head tobacco motif and bunches of grapes either side of the surround recall the tobacco and wine grown on Tocal. The region supplied over half of Sydney’s needs for tobacco and wine in the 1840s. The dark timber here suggests this room could also have been intended as a dining room.